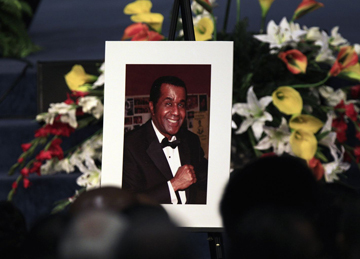 Hall of Fame trainer Emanuel Steward was celebrated by boxing royalty and the Queen of Soul at a star-studded memorial service Tuesday November 13 in the Motor City. Steward, the man who made the Kronk Gym famous, died of colon cancer last month at the age of 68. His family took its time to plan a memorial befitting a beloved public figure — and it was a hit. Champions he trained — including Thomas Hearns, Lennox Lewis, Wladimir Klitschko and Evander Holyfield — one he worked out only briefly — Sugar Ray Leonard — and another he didn’t train at all — Roy Jones Jr. — all paid their respects. “What a spectacular turnout of support,” HBO Sports commentator Jim Lampley said. “Over here, you have a section that I would call the Hall of Fame section. You would have to go to Canastota (N.Y.) in midsummer to the Hall of Fame to see anything even remotely approaching this group. 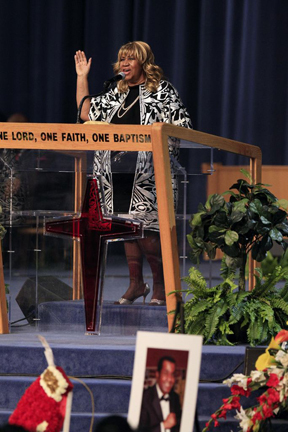 And if that wasn’t impressive enough, Aretha Franklin sang a stirring rendition of “I’ll Fly Away” in front of a few thousand witnesses at Greater Grace Temple. Franklin, a friend of Steward’s in Detroit for decades, said she wouldn’t have missed the memorial for anything. The city closed the original Kronk Recreation Center — a hot, sweaty basement gym — after vandals stole its copper piping in 2006. It was allowed to remain open, but it put Steward in a difficult financial situation and he later rented space at a gym in Dearborn so his young fighters could train. Now, there isn’t a Kronk Gym anywhere — and his family is hoping to change that. Steward, who was born in West Virginia in 1944 and moved 11 years later to the Motor City, trained boxers born and raised in Detroit such as Hearns. He was hired by boxers from all over the globe. Lewis was trained by Steward from 1994 to 2004, a period that included victories over Holyfield and Mike Tyson. Steward was an accomplished amateur boxer who chose to become a coach in the ring, starting in 1971 with a part-time position at Kronk for $35 per week. 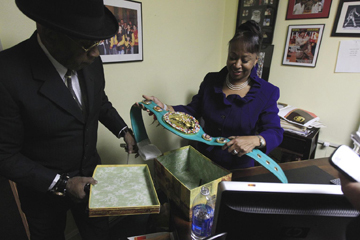 Hearns put the gym — and the trainer affectionately called Manny — on the map. Hearns was the first man to win titles in four divisions and he won five overall. The boxer known as Hitman lost some of his most famous bouts. Hearns was knocked out in the 14th round by Leonard in 1981 — a fight that Steward later said was the most painful experience of his life — and was on the short end of a three-round fight with Marvin Hagler in 1985 that is considered one of the best bouts in history. 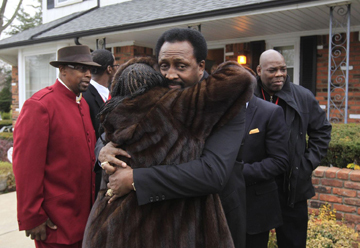 On an emotional day, which started in the morning with family, close friends and former fighters gathering at two homes Steward owned, Hearns was so overcome with emotion when he stepped up to the pulpit that he had to step back, wipe tears off his cheeks and gather himself. 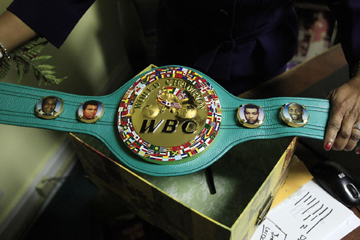 “If it wasn’t for Emanuel Steward, it would be very difficult to be where I am today,” Hearns said. "He wasn’t just a trainer to me, he was like a dad." Jones was trained by his father, and he told the AP he wished his mother hadn't talked him out of hiring Steward to be his trainer when he turned pro. When Jones got behind the microphone at the memorial, he compared Steward to Michael Jordan and Barry Sanders — one-of-a-kind talents that can’t be replaced — and said he has always carried a red-and-yellow Kronk Gym bag to every fight. Steward suffered cardiac arrest while he was hospitalized near Chicago last month, and it proved too much to overcome as he also fought cancer. 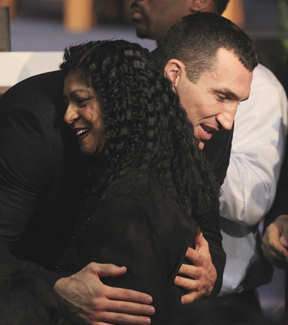 Just three days after retaining his three heavyweight titles in Germany, Klitschko traveled to Detroit with fresh bruises and cuts on his face to honor Steward, his trainer and friend. Klits­chko’s new trainer is fellow heavyweight Johnathon Banks, a Detroit native who was trained by Steward. When Banks arrived at Steward’s house on Tuesday, Sylvia Steward-Williams hugged him and shared four words that left him in awe. “It’s your time now,” the trainer’s eldest daughter whispered in his ear. A private dinner and party in Detroit followed the service. 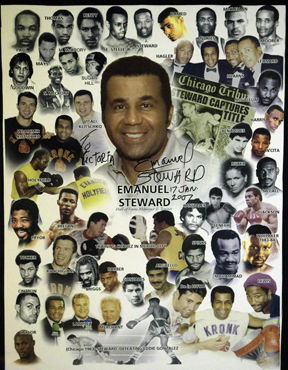 A poster honoring boxing trainer Emanuel Steward and the boxers he trained is seen in the trainer’s office in Detroit.